We’re not going to lie. We Passionistas are not really obsessed with our looks. On the average day, we’re make-up free kind of girls. And while we might not be considered great beauties, we’re lucky to have been blessed with good hair and good skin, which makes being lazy a little bit easier to pull off. Over the years we’ve been very fortunate not to have to deal with a lot of major breakouts. So when we recently went to an event for the launch of Dr. Lin Skincare, we figured we wouldn’t necessarily get much use out of the free Acne Clarifying Treatment kit. The very next morning one of us (which one shall remain nameless to protect our individual pride) woke up with a giant… we mean GIANT… pimple in the middle of our forehead — truly the worst zit to ever grace our faces. We quickly whipped out Dr. Lin’s kit, washed with the Daily Cleanser, dabbed on his Acne Lotion and followed it up with his Acne Spot Corrector. We couldn’t believe that within hours the pimple was shrinking away and the next day it was all but gone. So now we’re hooked. We wash each morning and night with the cleanser and then smooth on some very un-oily Daily Hydrating Gel before we go to bed. Our skin feels better than it has in years. But what does this have to do with Pop Culture you might ask? Well, among other things, Dr. Lin is the dermatologist to the stars. Ever wonder how those Kardashian girls manage to maintain their healthy glows? 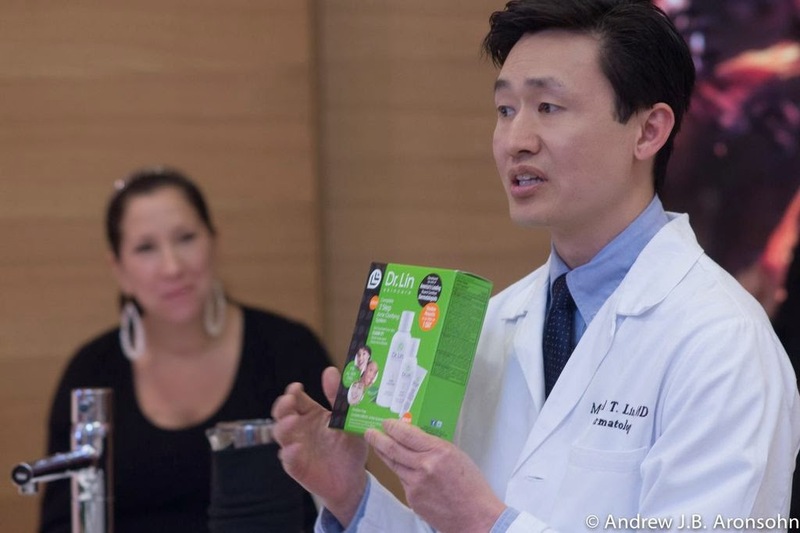 Look no further than Dr. Michael Lin. Also, we don’t call ourselves the Passionistas for nothing. And there’s nothing we like more than someone who is so giddy about what they do, that they can’t help but want to shout it from the rooftops. And Dr. Lin means everyone. While some at home treatments can cost $185 a month, he was determined to make his brand affordable. Now anyone can walk into retailers like CVS, Walmart and Ulta and get what Kim and Khloe would get at a much higher priced Beverly Hills office visit. We know we won’t be any more. To get additional information about Dr. Lin, visit his official website.